Autism on the Water is an organization of sailors on the spectrum from across the U.K. coming together to crew a Hunter 707 class sailing boat in the Geckotech 707 National Championship 2017! To put this all together is an amazing feat and accomplishment for Autism on the Water. Especially its founding member Murray Macdonald. 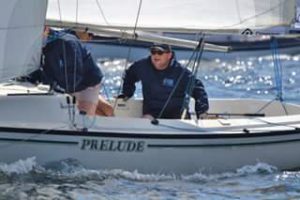 Set Sail for Autism and Bayview Yacht Club are proud to help Autism on the Water by sending our sailor Michael Sanchirico to Scotland to join their crew for the Geckotech 707 National Championship this year! 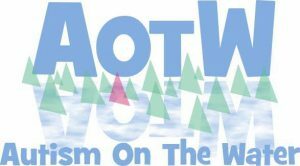 This is an amazing Story and Collaboration, we wanted readers to see who the crew of Autism on the Water will be this year. See Sail 707 to learn more about 707 sailing! See Michael’s GoFundme if you’d like to support Michael’s journey to the U.K.
See Autism on the Water to learn more. Murray is the founder of Autism on the Water. He was diagnosed with autism at the age of 7 in March 2000 after a long 5 year battle fought by his mother to obtain a diagnosis. Over the years Murray has come a long way, he was a pupil for 7 years at New Struan School which is a school purely for people with autism and Aspergers syndrome. During his time there, he learnt more about his autism and the way it affects him and others. He was instrumental in helping some of the developments of the younger pupils at the school and even gave a presentation at the Scottish Parliament demanding more services for autism!Murray comes from a strong sailing background having such a large family involved in it kind of helps! Murray first started sailing full time in 2005 when his late father bought a quarter tonner called Highpointer. At first he hated sailing but over the years the sport has been a huge development in Murray’s autism with confidence skills, problem solving skills and most importantly friendship skills, all three of which are extremely difficult for people with autism in everyday life. “This event is going to be amazing”! The class and its reps Eddie Batchlor and Dara O’ Malley have been hugely supportive to me and the campaign, they are giving us a race prepared boat for the event which is all being sponsored by Filament Coffee”. “The fact we have a full autistic team is just so wonderful, I never thought I’d get to this stage but I have and its so overwelming. I hope at the event we can achieve some good results but most importantly have fun and raise awareness of autism, after all Autism on the Water’s main goal is to improve the difference as we sail”! — with Murray MacDonald at Port Edgar Marina Ltd.
Mike Bowley is a Scottish sailor based in Edinburgh and has Asperger’s Syndrome. Mike was diagnosed in 2007 aged 43. Mike Started sailing when his family built a Mirror dinghy in 1974 which they sailed on the Moray Firth and round about the Summer Isles. He Became involved with dinghy team-racing when he was a student and then took part in club racing at Linlithgow and Port Edgar. He Started yacht racing at Port Edgar in the late 80s, first on an E-Boat and latterly mostly on a Beneteau First 30 Jezebel which won so much during its many years of racing. Mike Also became an RYA dinghy instructor in the late 80s, adding the advanced endorsement in the mid-90s. He has been on the staff of the Scout Association run watersports centre at Longcraig Point, Sounth Queensferry since 1993. 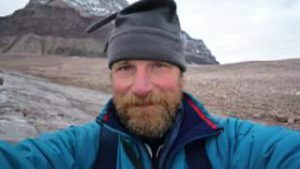 Besides dinghy and keelboat sailing, Mike has also been involved in doing coaching in kayaking, windsurfing and powerboating. “All the people I’ve met with autism or aspegers have been very different and I’m looking forward to meeting four new ones (I learn something new about myself each time). This will be the first time I’ve sailed with any Apies since I was diagnosed myself. It’s going to be interesting to find out what difference it makes and what adjustments will have to be made. Knowing how intensely people with aspergers and autism can concentrate, I’m expecting some extremely dedicated sail trimming, steering etc”. — with Mike Bowley at Port Edgar Marina Ltd.
Alexander Ahmann is Lottie’s partner and also has autism. Alexander first became interested in sailing and the maritime field in general as a child during summer camps and field trips, including an overnight on the replica 1825 hide brig Pilgrim in Dana Point California. 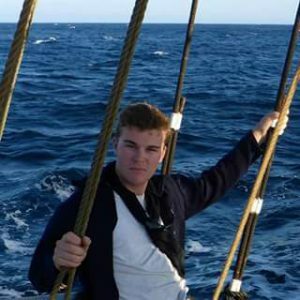 After a few years of studying the workings and history of old sailing ships he properly started his sailing career in the beginning of 2011 on Pilgrim, serving as a deckhand and topman in his first year. Afterwards Alexander steadily advanced through the ranks, acting as an ordinary seaman and then foremast mate the next year, then a watch officer and able seaman, and eventually mast captain and most recently boatswain. He crewed on several other tall ships in California and briefly in New York City. He moved to the UK in 2014 to study naval architecture and began racing modern yachts, both round the cans and offshore across the English Channel. Alexander is currently in his third season of the JOG offshore series along with some other racing. He continues crewing on Pilgrim whenever he returns to California, as well as racing a few different yachts and cruising on the Volvo 60 Wolfhound. In 2015 He co-founded the charity Ausome with Lottie which is currently in the process of becoming registered and aims to help autistic individuals develop life skills through sailing. 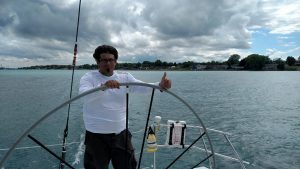 “I look forward to sailing with Autism on the Water because sailing has been the defining part of my life since 2011 and has helped me overcome many social issues in the past. I eagerly await being able to compete on a team with likeminded individuals”. — with Alexander Ahmann at Port Edgar Marina Ltd.
Lottie Harland is a very experienced sailor based on the South coast and dose many inshore and offshore races on the Solent. Lottie was diagnosed with autism when she was 9 after having a lot of struggles in school socially. However due to the lack of awareness at the time her schools refused to refer her for assessment so her parents had to have Lottie’s assessment done privately. Through all the challenges she experienced sailing has always been her rock, it helped her develop confidence and self esteem and was an outlet for the stress of school, and a safe place from the bullying. For this reason Lottie wants to help encourage other autistic people into sailing, hence why she is excited about the prospect of doing the 707 Nationals with a fully autistic crew and with Autism on the Water. 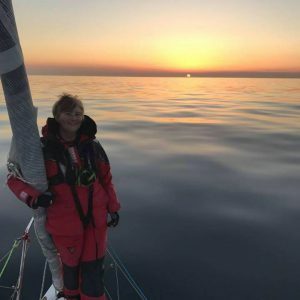 Lottie started sailing when she was 9 in Optimists at her local sailing club, Burghfield Sailing Club and she started racing the next year and caught the racing bug. Lottie moved to Toppers in 2008 and was selected for the RYA South Zone Squad. In 2009 she progressed to the RYA National Intermediate Squad and in 2010 she progressed to the RYA National Squad, in 2011 Lottie became British Female National Champion in Toppers. Due to the excellent results she got through both 2011 and 2012 along with the volunteer work she did and overcoming the challenges her autism presented Lottie was named Regional Young Sailor of the Year 2012 for London and Thames Valley and was one of three finalists for the National Young Sailor of the Year 2012. Lottie then moved to Laser Radials and in 2012 was selected for the RYA National Youth Squad, and through 2012 and 2013 competed at various events including European and World Championships. At the end of 2013 Lottie moved to yachts and in 2014 and 2015 was selected for the British Keelboat Academy. Lottie’s main focus is now offshore racing, preferable double or short handed. “I am excited about the prospect of doing some close fleet racing at the 707 Nationals as fleet racing and offshore racing both bring different challenges to the table which means I enjoy doing some fleet racing mixed with offshore racing”. — with Lottie Harland at Port Edgar Marina Ltd.
Michael Sanchirico is a sailor on the autistic spectrum and is based in the USA! Michael is part of the charity Set Sail for Autism which is perhaps the only known autistic sailing charity in the world! “I am excited to come to the U.K. and Join up with Autism on the Water to meet up with similar sailors from another country. I hope my experience with Set Sail for Autism might be of value in helping Autism on the Water’s goals in the U.K”. — with Michael Sanchirico at Port Edgar Marina Ltd.